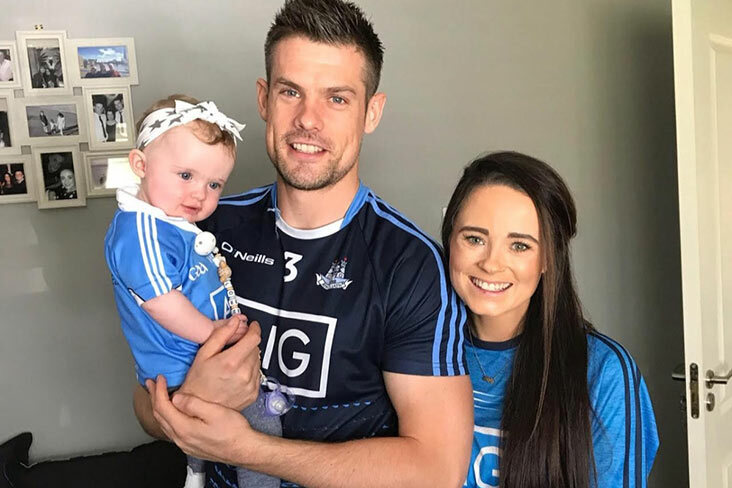 Dunboyne’s goal scoring hero in last year’s Meath SFC final win over Summerhill, Stuart Lowndes has been ‘blown away’ by the response to a fundraising campaign set up to help his wife Sinead undergo urgent medical treatment in the UK. The Lowndes family need financial help and support as they face an unexpected and urgent move to the UK, where Sinead will have to undergo a liver transplant, if not, double organ transplant. Back in November, Sinéad was a fairly typical 29-year-old woman - happy, healthy and planning her wedding to Stuart, having started a new part time career, while being a devoted mammy to her one year old daughter Paige. However, life threw Sinead a curve ball in November, just 6 weeks before her scheduled wedding day. Sinead felt unwell and ended up in hospital. After many tests, it was discovered that Sinead had a very rare liver condition named Budd Chiari Syndrome. The condition affects one in a million adults. This, she was informed, is a result of a genetic mutation of her blood called Jak2 which means she is now prone to blood clots. Unfortunately, what had been discovered is that clots formed both in and out of Sinead’s liver and in December 2018 she was given news that she would need a liver transplant. This news meant that Sinead and Stuart had to postpone their wedding 3 weeks before hand. After a long stint in hospital, Sinead got out just before Christmas and was being monitored in the meantime as an outpatient. They rearranged their wedding day and tied the knot in February 2019. It was the most magical day for all involved. Very soon after their big day, 4 weeks to be exact, Sinead became severly ill again and ended up back in hospital. It has been discovered that she has unfortunately developed another blood clot in her bowel which means she will not be able to receive a liver only transplant, she may need a small bowel transplant also, and a double organ transplant cannot be done here in Ireland. The complications mean that she will have to have her surgeries in the UK, moving her family there for up to a year from as early as next week. Sinead will have to be in Cambridge for at least two months awaiting the transplant, and once it is done she will need to remain in hospital for at least a further three months and then stay in london to be close to the specialists for a further six to nine months. While the majority of the medical costs in the UK will be covered by the HSE, Sinéad and Stuart have medical bills from Ireland. Sinead has had to leave her career, and although Stuart has had to temporarily leave his job, his employers have been incredibly supportive during this hard time and have agreed that when he is in a position to return to work his job will be there for him. They are now facing a year of living expenses in a foreign country whilst covering their existing bills and mortgage at home with an income that won't make a dent in their monthly expenses and we, her friends and family, think that money shouldn't be something they have to worry about at this time. We're asking you to donate what you can to help the bravest, strongest, kindest and most amazing mother, wife, daughter, sister, aunt, cousin and friend through the toughest of times. Any money raised that Sinéad and Stuart don't need will be donated to the charitable wings of St Vincent's Hospital, Dublin and Addenbrooke's Hospital, Cambridge.